Whether you’re in the mood for cocktail, coffee, or a hearty meal, the new Greenwich Grind is a destination designed for all occasions. London coffee and restaurant brand Grind has been a cult favourite amongst busy city dwellers looking for a trendy, all-day hangout with music, coffee, food and cocktails. Greenwich Grind is the brand’s first location outside of London’s Zone 1, bringing the inner-city Grind experience to the locals, visitors and tourists of this laidback suburban neighbourhood outside of London. Nestled in a charming heritage-listed building opposite the famous Greenwich Market, the trendy coffee-and-cocktail restaurant was once home to the well-known Jamie’s Italian Kitchen by celebrity chef Jamie Oliver, a reputable restaurant attracting locals and tourists alike. The new establishment now boasts unique, eye catching details such as pink neon signs, rich teal blue walls and monochromatic tile floors that echo the sophisticated, feminine, and shabby chic vibe of Grind. The establishment marks the 12th project for Grind by award-winning, Australia-based design studio Biasol, as well as being one of their most challenging Grind projects to-date due to its large scale. The venue is divided into three spaces that function independently with individual character and aesthetics, but combines seamlessly to create a holistic Grind experience: A cocktail bar and lounge section, an all-day restaurant section for dine-in customers, and a grab-and-go deli/takeaway area. Upon entry, you can choose to stay in the chic, pink-and-grey dining hall or enter the adjacent Green Room where an intimate cocktail bar with a rich turquoise-blue backdrop and plush bar stools welcome the after dinner and late-night crowd for a luxurious, hand-shaken cocktail. Pink and textured grey furniture highlight the grab-and-go deli/ takeaway area by the entrance with Grind’s signature pink neon lights with quotes like “Do you remember the first time” and “What is this feeling called love” affixed on the concrete-render wall with subtly distressed finishes. Biasol embraces the heritage building’s original details by painting directly over the brick walls, revealing the ragged textures of the brick lines without compromising on the colour. Honed marble counters and tabletops are paired with luscious velvet fabric chairs, banquettes and stools to create a luxurious and timeless feel. Black-and-white honeycomb mosaic flooring with inlaid branding covers the restaurant floor, encouraging photo-ops for the younger crowds. The all-day restaurant for dine-in customers stretches the length of the restaurant, offering a variety of seating options including communal tables, dining tables and banquettes to accommodate different group sizes. As you walk further towards the back of the restaurant, the main dining room opens up to a bright, airy and alfresco space where guests can relax and dine within the conservatory-like environment under a beautiful glass-atrium roof. The abundance of greenery is a reflection of Greenwich itself, a region known for its lush green parks and historic architecture. A separate coffee and cocktail bar wraps around corner wall of the dining hall, catering to dine-in guests. Plush bar seating surrounds the marble bar table, providing guests with a full view of the drink making process while letting them easily interact with the counter staff. During patio season, guests can opt to have their meals or drinks in the outdoor seating area at the back of the restaurant through a set of black french doors. Black frames from the furnitures, doors and windows creates a stark contrast against the glass-atrium and surrounding white walls, bringing attention upon the structural outlines of the architecture. 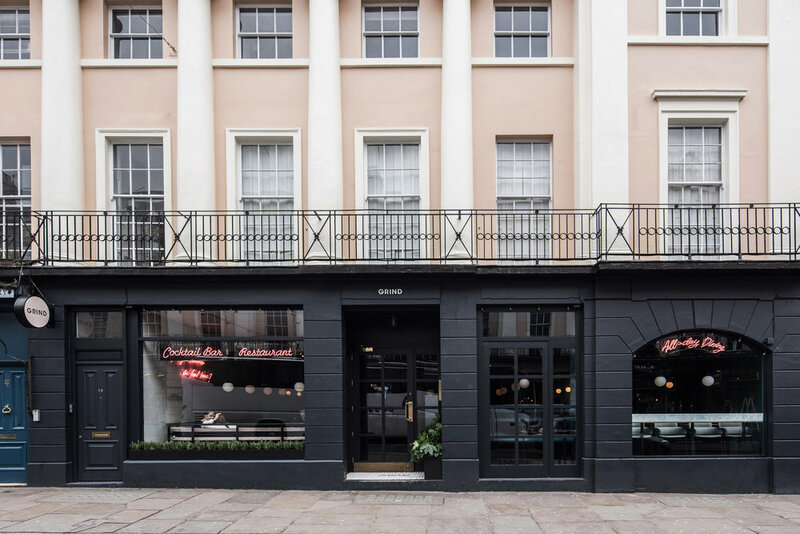 The ultra-chic interior combined with endearing brand messages and a flexible all-day, all-occasion restaurant/ cafe/ bar concept makes the Grind a beloved cult favourite amongst Londoners and tourists alike. Our love for this unique restaurant concept and the minimal yet sophisticated design style by Biasol, drew us to feature the newly completed Farmer J restaurant by Biasol in a previous Pendulum Design article. Visit here to read the full article.